As a professional manufacturer, we can offer all kinds ofthesanitary pipe fittings and can manufacture them according toanydrawings. If you are interested in, pls don't hesitate tocontactus. Product ranges:SANITARY STAINLESSSTEELTUBE FITTINGS ( 3A, IDF, DIN, SMS, RJT, BPE ) - Ferrule,TubeClamp, Tube Support & Hanger, Tube Union, Flange, Elbow,Tee,Cross, Reducer, Gasket & O-ring, End Cap, Sight Glass...etc.SANITARY VALVES - Butterfly Valve, Plug Valve, Check Valve,BallValve, Control Valve, Auto Valve( CompressionValve/Air-ActuatedValve ), Sampling Valve ...etc. 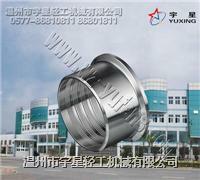 SANITARYSTAINLESS STEEL TUBES andSANITARY PUMPS...etc. products areapplicable to theClean-In-Place( CIP )process.